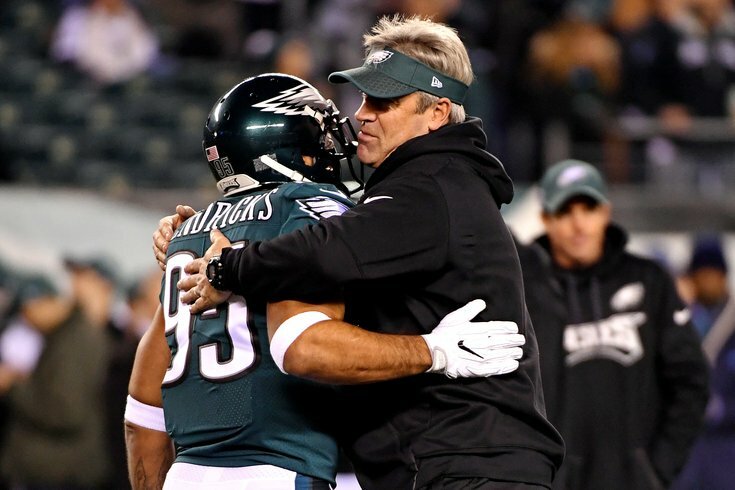 The loss of Mychal Kendricks is going to tear apart the carefully woven fabric of the Eagles' locker room. In case you hadn't heard yet this offseason, repeating as champions in the NFL isn't easy. As you probably know by now, there hasn't been a repeat Super Bowl champion since the 2003 and 2004 New England Patriots. Getting to the top of the NFL is hard, and staying there can be even harder. However, one of the odd notions this offseason has been that the reigning Super Bowl winning Philadelphia Eagles are going to experience an unexplained "Super Bowl hangover." That phrase may mean different things to different people, but to me it means that the team is going to crap the bed in some mysterious way. In a piece for ESPN, Mike Sando asked executives from across the league to pick out flaws for all 32 teams, with direct quotes from insiders. It's well done by Sando. Here's what the unnamed executive said about the Eagles. "I'm worried about a Super Bowl hangover. The defense got older, the quarterback has to prove he can be what he was, the dynamics in the locker room changed and then you always have guys who want to get paid after winning it all, and I'm talking about everybody in your building. They ran off some longtime Eagle guys like Brent [Celek], [Vinny] Curry and [Mychal] Kendricks, and added some guys from other teams with storied pasts." To begin, I'll just answer the question posed in the headline of this article right off the bat. "Super Bowl hangovers" are a myth. • 1990 Giants: Bill Parcells retired after the Giants' 1990 Super Bowl win, and rather than promote defensive coordinator Bill Belichick to the head coaching position, they instead gave the job to running backs coach Ray Handley, who was inept and overmatched. • 1998 Broncos: John Elway retired. • 2001 Patriots: The 2002 Pats only lost two fewer regular season games than they did the year before, at a time when Tom Brady wasn't yet the dominant player we know today. • 2002 Buccaneers: They were led by Brad Johnson, which was always going to make a sustained run more difficult than a team with a good quarterback. • 2005 Steelers: The Super Bowl winning Steelers in 2005 were a 6 seed, so a small dropoff out of the playoffs wasn't crazy. In addition, in 2006 Ben Roethlisberger had all sorts of issues. He nearly died after an offseason motorcycle crash, he had an emergency appendectomy, which caused him to miss the first game of the season, and he suffered a concussion at a time when protocols barely existed, that preceded a losing streak in which Roethlisberger did not play well. • 2008 Steelers: The 2009 Steelers suffered significant injuries, including another Roethlisberger concussion, and they still won 9 games. • 2011 Giants: The 2012 Giants matched the 2011 Giants' regular season record of 9-7. • 2012 Ravens: The 2013 Ravens lost a whopping eight starters from their Super Bowl run, including Ray Lewis. • 2015 Broncos: Peyton Manning retired. Overall, the average number of wins the following season after a Super Bowl win in the time frame above is 10.8. The notion of a mysterious "Super Bowl hangover" simply doesn't exist, for the winner of the Super Bowl, anyway. For the Super Bowl loser? That's a different story that we won't get into here. Since we're on the topic, the unnamed executive did give several reasons for a potential Eagles "Super Bowl hangover." Most of them are dumb. So? That can be looked at a number of different ways. The entire secondary will be back for another season together, and the continuity/communication between the corners and safeties is a very underrated advantage. Certainly, a couple of their backup veteran defensive ends -- namely Chris Long and Michael Bennett -- are getting up there in age, but that can't actually be the argument for a dropoff, can it? "The quarterback has to prove he can be what he was." That's certainly a legitimate concern. Carson Wentz has to show that he has come back from his ACL/LCL tears, and stay healthy. On the field this training camp, however, he threw with more accuracy and velocity than he ever has. "The dynamics in the locker room changed." Oh have they? Do tell how, exactly. "You always have guys who want to get paid after winning it all." The Eagles only have five starters who aren't signed through at least the next two seasons. They are Brandon Graham, Mike Wallace, Ronald Darby, Jordan Hicks, and Jay Ajayi. While it's certainly possible that one or more of those guys are miffed behind the scenes, not a single one of those players has exhibited any behavior at all that might be construed as a distraction. "They ran off some longtime Eagle guys like Brent [Celek], [Vinny] Curry and [Mychal] Kendricks." They were all extremely obvious salary cap casualties. Every team in the NFL has cap casualties every year. While Celek was thought of as a leader, it's not as if the Eagles aren't loaded with veteran "positive influence players" like Wentz, Nick Foles, Darren Sproles, Jason Peters, Chris Long, Jordan Hicks, Malcolm Jenkins, and Chris Maragos, to name a few. To note, I assume this executive is referring to those players as locker room losses, not significant on-field losses. If it's the latter... Really?!? "...and added some guys from other teams with storied pasts." Who? Michael Bennett? By all accounts, Bennett has assimilated into the Eagles' locker room seamlessly. But, OK, fine, we'll count Bennett. That's one. Who else? I guess Daryl Worley was added to the team in March via trade, and was quickly released after an arrest, but I hardly think his presence on the roster on paper for a month infected a locker room that he was never actually in. Anyway, the notion of a "Super Bowl hangover" is just kind of something to say, but isn't actually rooted in historical precedent.